The Bristol International Balloon Fiesta is the largest annual hot air ballooning event in Europe, and it is also one of the top outdoor festivals in the UK. Held each August over several days, the Bristol Balloon Fiesta events include the mass ascension of over 100 hot air balloons, nightglows, balloon competitions, and fireworks. In addition to the balloons, the free festival also offers on-site family-friendly amusement rides, games, and musical entertainment. We were excited to attend the Bristol Balloon Fiesta last year to see this colorful festival. If you are interested in attending yourself, we’ll cover all the logistics, share all you need to know to plan your own time at the fiesta, and share our own experiences attending the hot air balloon fiesta. 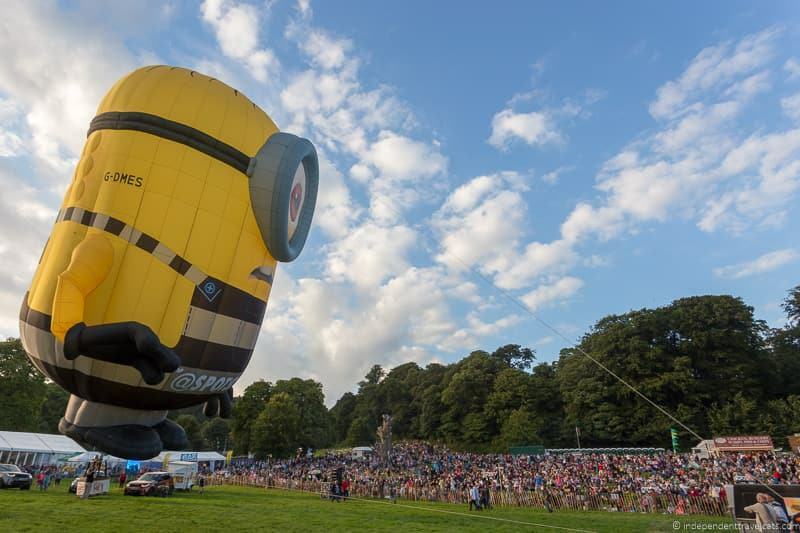 When is the 2019 Bristol International Balloon Fiesta? Where are the Balloon Fiesta events? How Much is the Admission to the Bristol Balloon Fiesta? How many days should I attend the Bristol Balloon Fiesta? What are the Main Events at the Bristol International Balloon Fiesta? What are the Best Days to attend the Balloon Fiesta? How do I get to the Balloon Fiesta? How Early should I arrive for the Bristol Balloon Fiesta? Are there upgraded experiences available? Accessibility at the Bristol Balloon Fiesta? What about Food, Drinks, and Toilets? 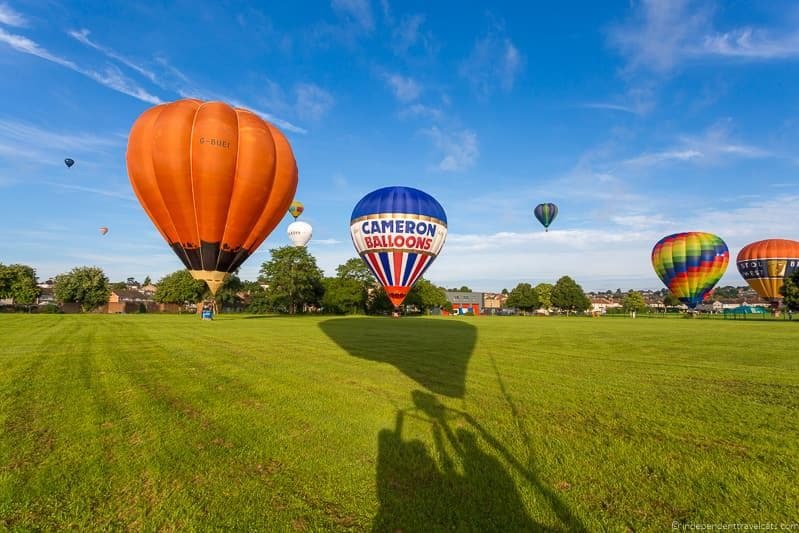 Tips for Booking Accommodation during the Bristol Balloon Fiesta? How do I know if the Fiesta is going to be cancelled due to Weather? What happens if a Balloon Fiesta event is cancelled? Can I Ride in a Hot Air Balloon during the Balloon Fiesta? Can I see the Balloons from outside Ashton Court Estate? 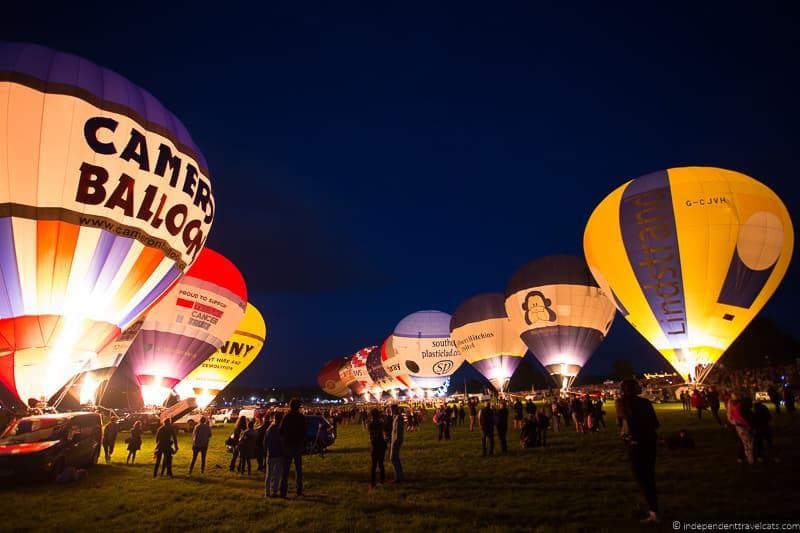 Below we’ll cover all the logistical information related to attending the Bristol International Balloon Fiesta, including getting there, understanding the festival events, parking, booking lodging, and finding the best balloon viewing spots from the city. The Bristol International Balloon Fiesta takes place each August, and usually runs for 4 days over a weekend. The dates change each year so be sure to check the official website. 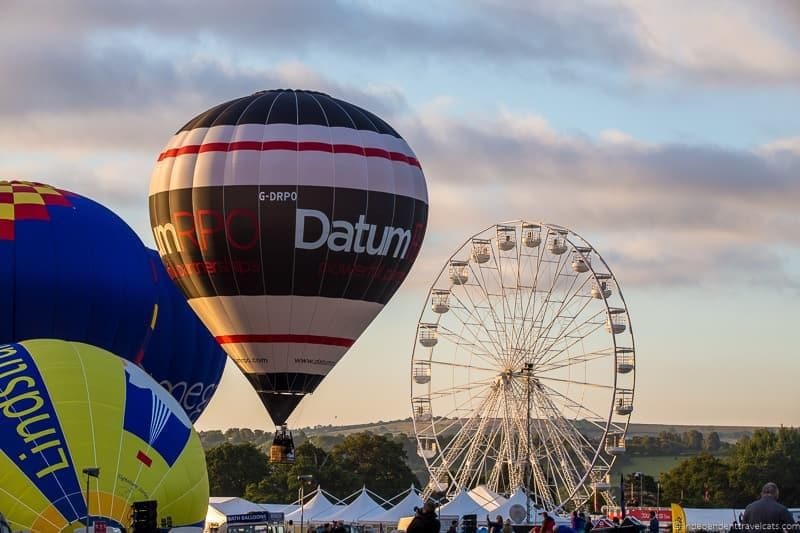 The 2019 Bristol Balloon Fiesta is scheduled from August 8th to August 11th. 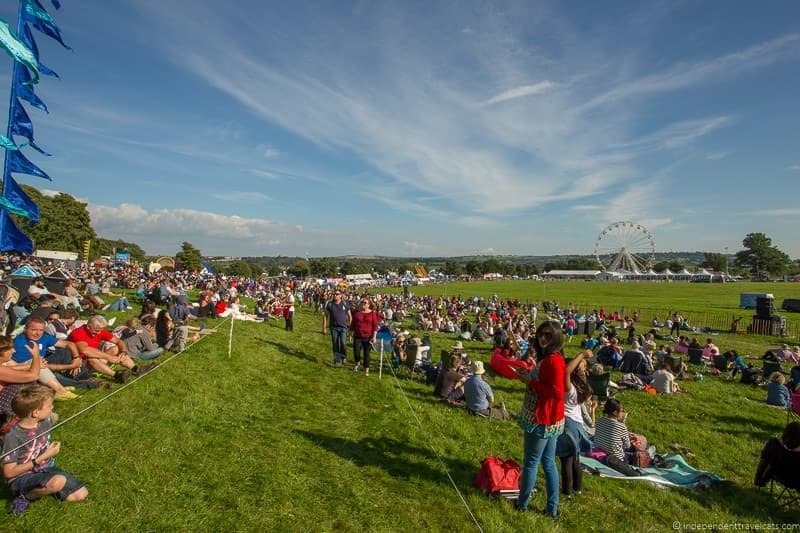 All the main events of the Bristol Balloon Fiesta take place within a section of the Ashton Court Estate in Bristol, England. This location is about 4 miles southwest of central Bristol, and a general address is Ashton Court Estate, Long Ashton, Bristol, BS41 9JN. There are several parking lots in use for the event and you should follow signs to park once you get near the park. Many people also walk, bike, or take a shuttle to the event. 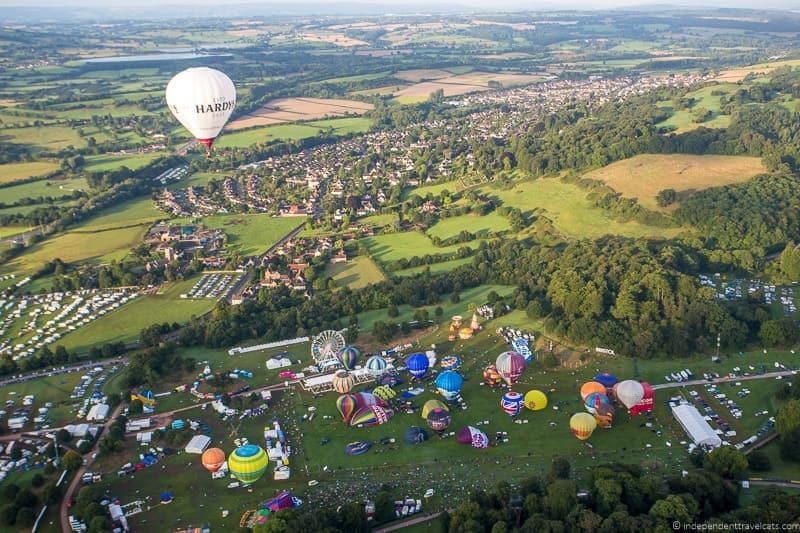 Admission to the Bristol International Balloon Fiesta is FREE! It is one of the largest free events in the UK and Europe. However, you do have to pay for parking if you choose to park a vehicle. I would plan to come for as many days as you can spare as the events are all weather-dependent. Some people just come for one day and hope for the best, but I would advise to come for at least 2 or 3 days so that you have a good chance of being able to see the balloons launch. If you can be around the full festival, that would give you the best chance. 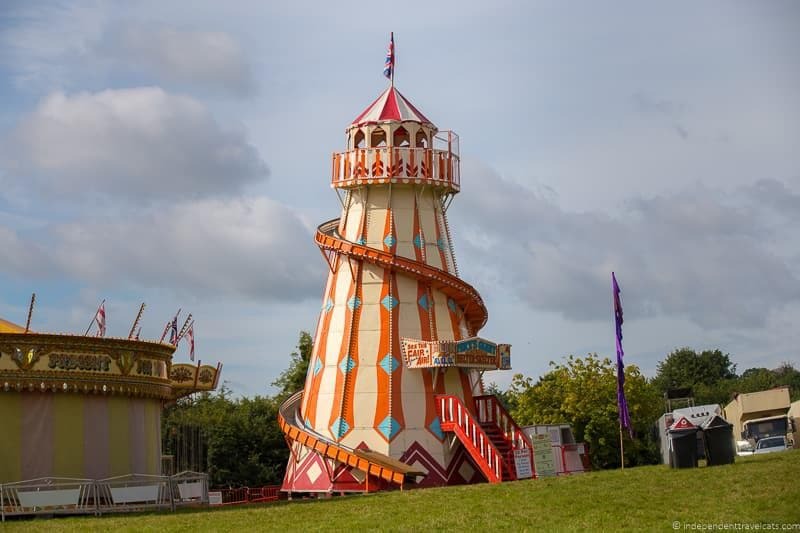 If you come for the full festival and the balloons go up early in your visit, you can then spend your time exploring Bristol which has loads of interesting attractions. See our suggested 2 day Bristol itinerary and street art guide for advice and ideas. There are also a lot of interesting Bristol day trip possibilities like Cheddar Gorge and Bath. Note that these events take place on different days of the fiesta, so check the schedule to see when each is being offered. Most events take place on multiple days. Mass Launches – These are also generally referred to as mass ascensions or mass ascents and the events may also be labeled as “Morning Balloon Lifts” and “Evening Balloon Lifts”. These are perhaps the main events where up to 100 hot air balloons all launch in the same period of time, generally over a 1 to 2 hour period. They will launch in waves so that balloons will be set up, inflated, and launched from the field in a sequence. The Bristol Hot Air Balloon Fiesta usually features both morning and early evening launches. If the weather is good, the morning launches usually begin around 6:00am and the evening launches around 6:00pm. However, weather or other delays often causes these to take place a bit later than expected. Balloon Tethering – This is where a number of hot air balloons are set up in the field but are tethered to the ground so they are not able to launch into the sky. This is often done in the afternoons to give visitors a chance to see the balloons. This also may be done for vintage balloons or special balloons that the pilots do not want to fly. Tethering may also take place if a mass ascension is canceled due to the weather but it is safe enough to set them up. Nightglows – Taking place just before dusk, pilots inflate their hot air balloons and keep them tethered to the ground. 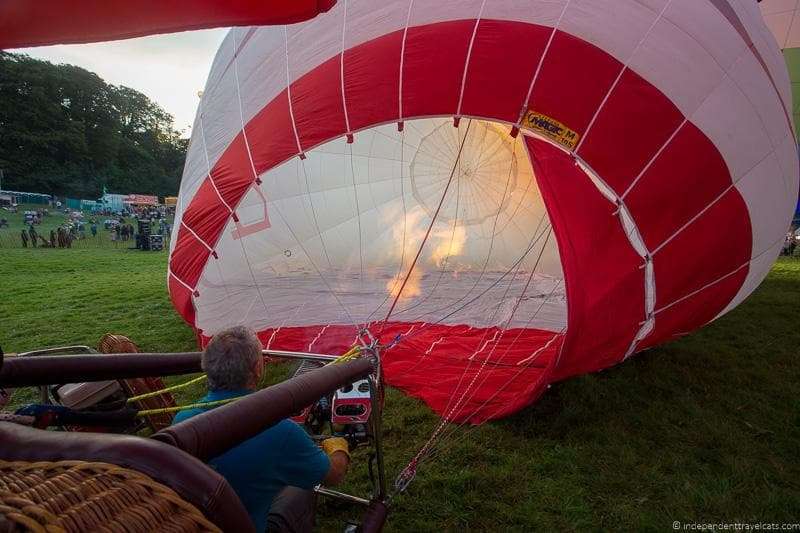 Then once dark, the pilots will periodically ignite their propane burners so that the balloons light up and glow. They will do synchronized burns to music and “all burns” where all the balloons will light up at once. The evening balloon glows are often followed by fireworks. These are many visitors’ favorite events of the Balloon Fiesta. Special Shape Balloon Events – In addition to the traditional and most common inverted teardrop shape balloons, there are numerous special shaped balloons. These balloons can be shaped as cartoon characters, company logos, animals, hearts, people, etc. Special shape balloons are included in most of the other events but there is usually one event that only includes the special shape balloons. A favorite during our visit was Stuart from the Minions films. Model Balloon Displays & Competitions – Events involving model hot air balloons that people have made. These balloons may be made out of paper, fabric, or other materials and are smaller working versions of the full-sized balloons. 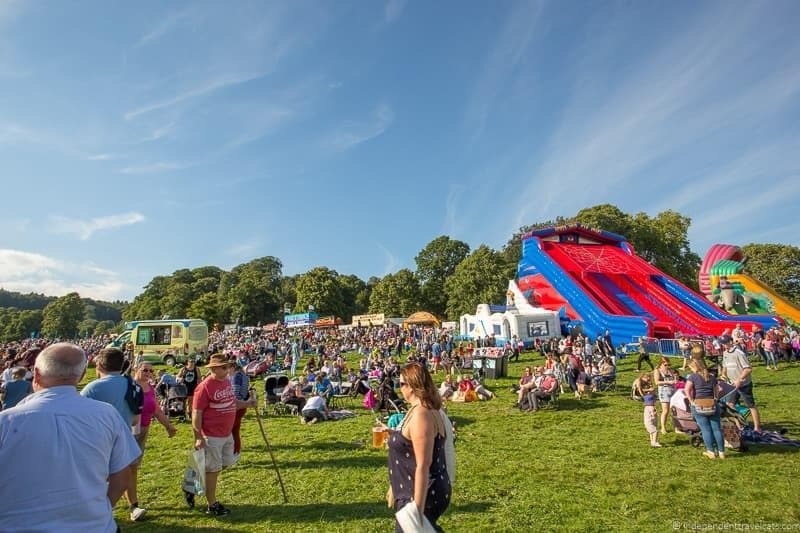 Other Events & Activities – There are also other attractions or events scheduled each year that take place in the afternoons or evenings at Ashton Court Estate in between the balloon events, such as music performances, dancing, family events, and flying competitions. There are also rides, carnival games, local trade vendor booths, and food vendors within the park that are generally open throughout most of the day. 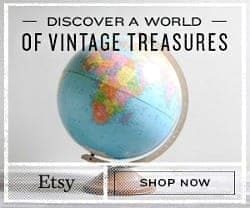 I would check the festival schedule and base your visits around the events you want to see. The most popular events are the mass ascensions and the nightglows. We found that the morning events are a lot quieter than the evening events. To avoid crowds come to morning and weekday events. The most crowded events are the Friday night and Saturday night events. We’d recommend attending both a morning mass ascension as well as a nightglow and fireworks display. I’d check the website schedule and also get an official program once at the event which provides more detailed listing about all the bandstand events as well as the balloon events. Do a little research so you know what you are most interested in seeing! There are a several ways to get to the event which takes place within the Ashton Court Estate. There is no admission fee to enter the event, but you do need to pay if you park. Just note that no matter what method you arrive, there will be a 10 to 20 minute walk to the field. 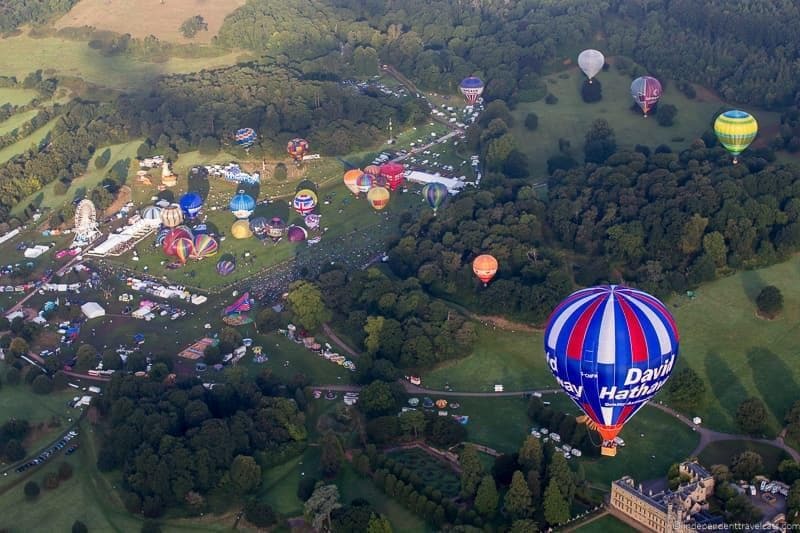 There are large parking lots located within Ashton Court Estate that are used to accommodate Balloon Fiesta visitors. The cost of a parking spot the main parking lot in 2018 ranges from £11 to £22 with the most expensive spots being nearest the event entrance. The parking tickets are valid for the entire day whether you go in the morning, evening, or both. Special disabled parking spots can be reserved for individuals with a valid blue badge, and these tickets range from £9 to £12. The parking spots can be booked in advance via the fiesta website (strongly recommended) or paid for on arrival. If you are planning to go on a weekend, I’d book in advance as the parking lots do sometimes fill to capacity leaving some people with no way to park. If you book in advance you are guaranteed a spot as long as you arrive by the designated time on your ticket (which is normally 5pm). Note: Due to limited space, oversized vehicles such as large campervans, recreational vehicles (RVs), and motorhomes are NOT permitted to park in the event parking lots. Coach and tour bus operators must get advanced permission and booking to park in a special coach parking area. 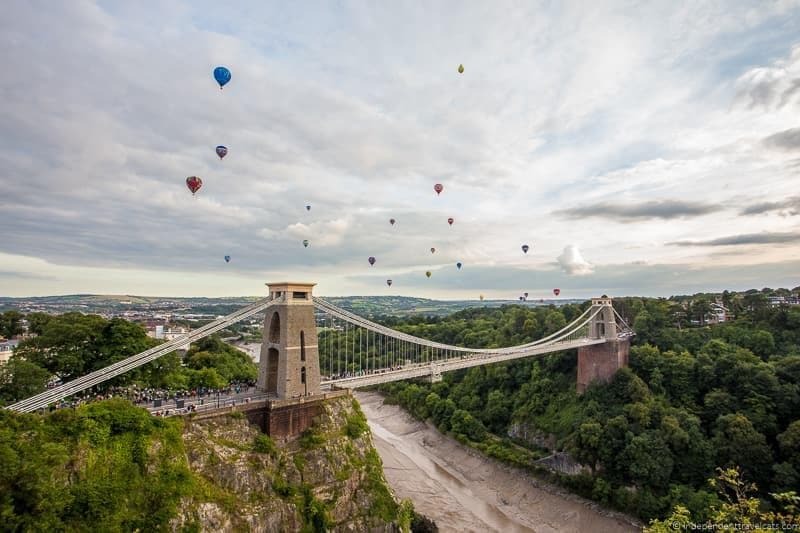 A shuttle bus service for the Balloon Fiesta is operated by First to and from Temple Meads Train Station, the City Centre (stop on Colston Avenue), and the Fiesta Park. You can purchase a ticket on the bus (bring cash). In 2018, tickets cost £3 for an adult single or £5 for a return, while child, student, and concession tickets cost £2 for a single and £3 for a return. It is about a 20 minute walk from the shuttle bus stop to the balloon field. The shuttle buses are popular, especially leaving the event, but they run regularly (about every 10 minutes) so the lines generally move fairly quickly even with the large crowds. View the 2018 Bristol Balloon Fiesta shuttle schedule here. You can also book a Uber or taxi ride and ask them to drop you off at the designated drop off/pick up location, which is a short walk from the festival site. We recommend pre-booking taxis or Ubers and if looking for a comparison of cab quotes, we often use minicabit in the UK to find the best cab price. Just note that during the busiest times (especially evenings) most taxis and Ubers won’t pick up or drop off at Ashton Park Estate to avoid getting stuck, so you may need to meet them or get dropped off at a point away from the park. Also note that rates will be higher than normal during the Festival. A healthy way to reach the park is to ride a bike. There is a “Festival Way” path that connects the city to the Ashton Court Estate. From Bristol, join the National Cycling Route 33 which takes you on a traffic free path from Queen Square out of the city via Cumberland Road. Crossing the River Avon you join Kennel Lodge Road and enter Ashton Court. There is bike parking available onsite for the Balloon Fiesta, usually located by the Mansion House. Walking is great way to come to the event, especially if you are staying in the west side of Bristol. There are two main walking routes into the Fiesta site via Festival Way (see biking path described above) or via the Clifton Suspension Bridge. If you want to visit Bristol in a campervan or stay in a tent, you should be able to find a spot within walking distance (20 to 30 minutes) of the event if you book in advance. There are usually at least one or two temporary camping spots open during the festival that include both pitches for people to set up motorhomes or tents, as well as pre-pitched tents and rustic cabins for those without all the camping gear. Exact locations and prices change each year (details should be on the fiesta website closer to the event) but I’d check out Kingcott Farm on Beggar Bush Lane and Cotham Park. Of course, there are also plenty of other camping sites in and around Bristol, but book early if you want one within walking distance. 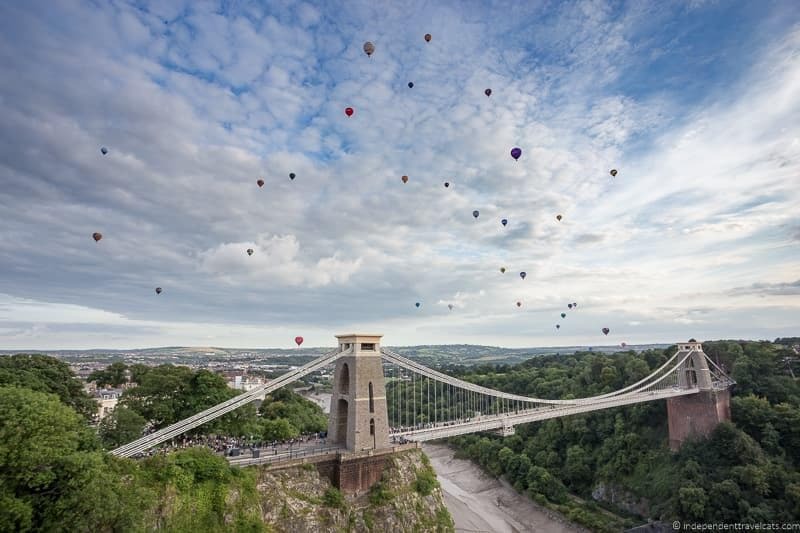 Important Note for everyone: The Clifton Suspension Bridge generally closes (to pedestrians, cyclists, and drivers) on the evenings of the Balloon Fiesta events around 6pm. So you can generally cross it going but not coming back from events. This is done to prevent stresses on the historic bridge caused by unusually heavy traffic during and after the Fiesta. So if you plan to use this bridge to get to the festival, be prepared to go back another way. The bridge may be closed each evening of the balloon festival, or it may just be closed during the weekend evenings. The closure dates and times will be widely announced in advance. If you are going to drive, we recommend pre-purchasing your parking tickets in advance online before the event as they have sold out on several days in the past few years. Arrive early and allow extra time for the increased traffic. Obviously the earlier in the day you arrive, the closer you’ll be able to park to the field. It is generally a 10 to 25 minute walk from the parking areas to the entrance of the Fiesta area. I’d recommend planning to be at the park at least 1 hour in advance of any event you want to attend to give yourself enough time to get into the park and find a good viewing area. The morning events are not generally as busy as the evening events, so if you come 40 to 60 minutes early you should get a good spot to watch the event. In the evening, it is generally much busier and it can be hard to get a good viewing space unless you arrive early. The weekend evenings of the balloons glows are very busy! Saturday is generally the busiest day with the most events scheduled and I’d arrive a couple of hours before the balloon events begin to look around and get settled into a spot. Some people come to claim the best spots hours in advance for the evening events. So it really depends on how eager you are to get your pick of spots. I’d come to the Bristol Balloon Fiesta and try to make a full day out of it for the best experience. On the weekends, many people come early to spend the day to enjoy the amusement rides and music and then get food and settle down on the field to watch the balloons. A lot of people bring blankets, towels, or chairs to sit on as well as snacks and things to do (e.g., cards, toys, books) in between events. The field is sort of like an amphitheater and gently rises up so it allows for better viewing despite the number of people. General entry into the event is free and everyone has access to the same places. You can pay for Premium Parking which means that you get to park in the parking lot closest to the event. You will likely notice the Members Enclosure within the roped off areas, and this area is only for the balloon crews, authorized press, and those who have joined as Members or Sponsors. If your business or the company you work for is a Member or Sponsor of the event, you may be able to get a pass where you have access to special facilities, meals, balloon flight tickets, and more. Membership begins at £2,000 and you can check out the membership details and apply online. The event is held in a large grassy park with small rolling hills and there are some uphill bits. However, there are special disabled parking lots (for those with a blue badge), wheelchair accessible toilets, a special viewing area, and motorized scooters available for rent at the event. Those with disabilities or mobility difficulties should check out the event accessibility page and contact the event team in advance with any questions. There are plenty of food vendors selling all sorts of food and drinks during the event. There’s a lot of grilled food, sandwiches, snacks, and the like. All kinds of beverages from coffee to soda to beer are available. 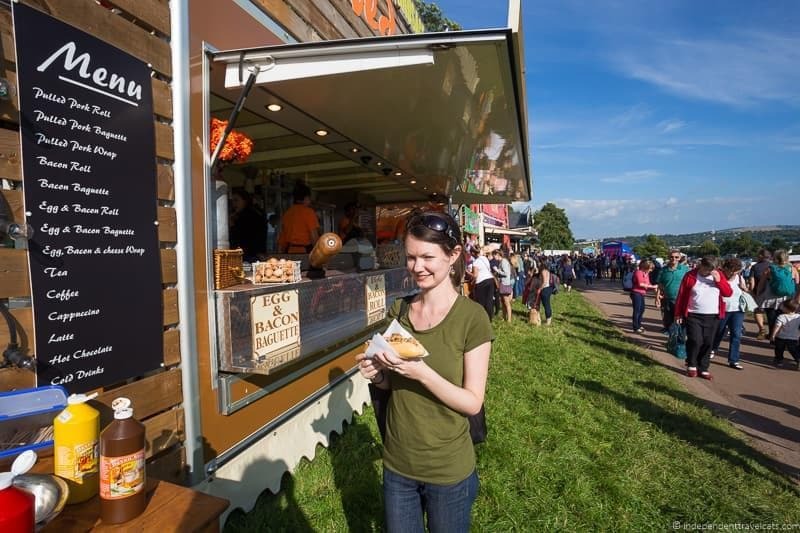 Expect to pay festival prices for food and drinks. 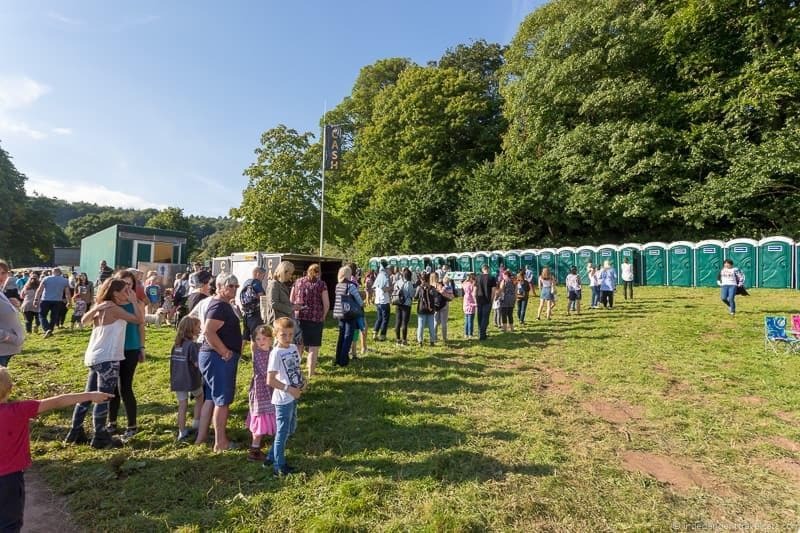 There are also a lot of portable toilets at the event although they are almost always busy given the crowds. The lines to use the loos, especially during the evening events, can be very long and it can take 30 minutes. Bringing along tissue paper and hand sanitizer may be wise just in case it runs out and is needed. Just plan accordingly! August, particularly the week around the Bristol International Balloon Fiesta, is typically the busiest time in the city. So you will want to book hotels in advance and expect to pay higher prices than normal. If you book at least a few months in advance you should be fine but your choices will be slim if you wait until the night before you leave. Bristol has lots of accommodation options, that range from budget hostels to cozy bed-and-breakfasts to luxury hotels. There’s also a wide range of apartment rentals, and we opted for an apartment rental on our most recent visit as it gave us the flexibility to dine in as well as some working space and laundry facilities. 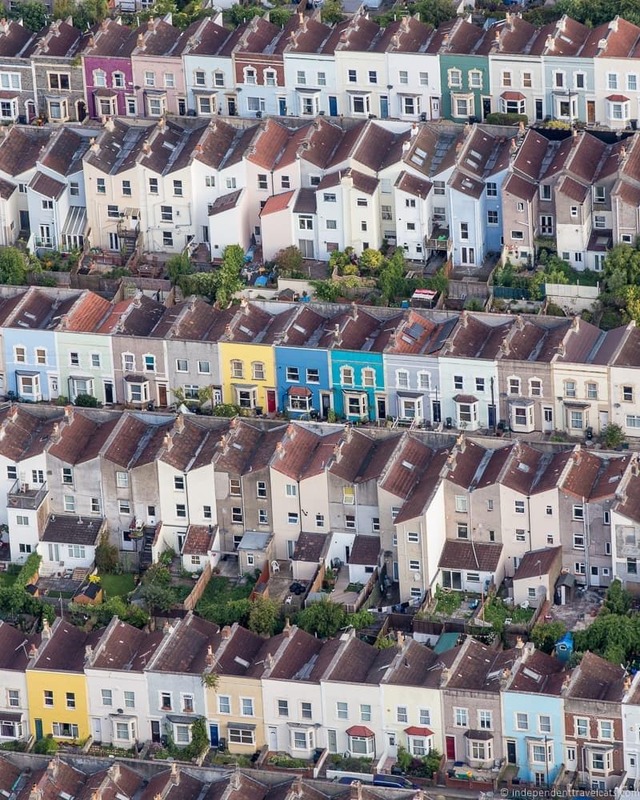 In terms of location, central Bristol is always a good choice so you can wander the city on foot. If you are staying in a central location, you should be within walking distance to catch the Balloon Fiesta shuttle buses which normally stop at Broad Quay. If you want to walk to the festival and want a shorter walk, look for a place on the west side of the city such as the Clifton, Southville, or Ashton Gate neighborhoods. If you are looking for a room or apartment in Bristol, we also recommend checking AirBnB. If you’ve not used them before, you can get $30 off your first AirBnB booking with this link. There are also a lot of other apartment booking websites out there. Sometimes, such as in the case of a bad storm, they will cancel an event hours in advance or even a day in advance. However, in most cases you will probably not know about cancellations or delays until the event is about to start or maybe even after it was already scheduled to start. Hot air balloons are highly weather dependent and it is not safe from them to fly if the conditions related to the wind, clouds, rain, or visibility are not right. The mass launch events are the events that are the most weather dependent and are the events that are mostly likely to be delayed or cancelled due to weather. Sometimes the weather may be questionable and flying left to the judgement of the pilots with some pilots deciding to fly and others staying grounded. The balloon tethering, evening balloon glows, and fireworks also are weather-dependent but have fewer restrictions. If you are at the event, you’ll hear periodic updates on the field through the speaker system about any delays or cancellations. 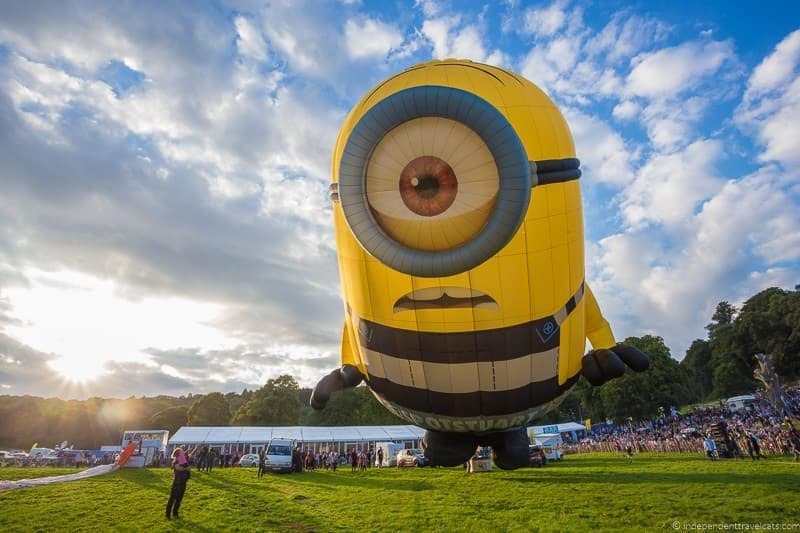 The best places to get live updates online is from the Bristol Balloon Fiesta Twitter account. The local radio stations and TV news stations will also be providing updates throughout the event. We’ve been to several hot air balloon events now, and the weather is always the most frustrating and unpredictable factor. Cancellations due to weather happen each year and the number of cancellations and delays vary each year so they are fairly impossible to predict in advance. But if you go to the Balloon Fiesta with this knowledge and are flexible to return another day, then you can make the most of the situation. I would check the weather forecast and try to plan to go on days when sun and clear skies are predicted if you can. Admission to the event is free. But you should check the terms and conditions of any purchased parking tickets or other event bookings, but generally tickets are not transferable or refundable in the event of a delay or cancellation. Of course even if one of more of the balloon events are cancelled, the other events (e.g., music performances) will likely still take place and the rides, games, trade booths, and food vendors should still be open. 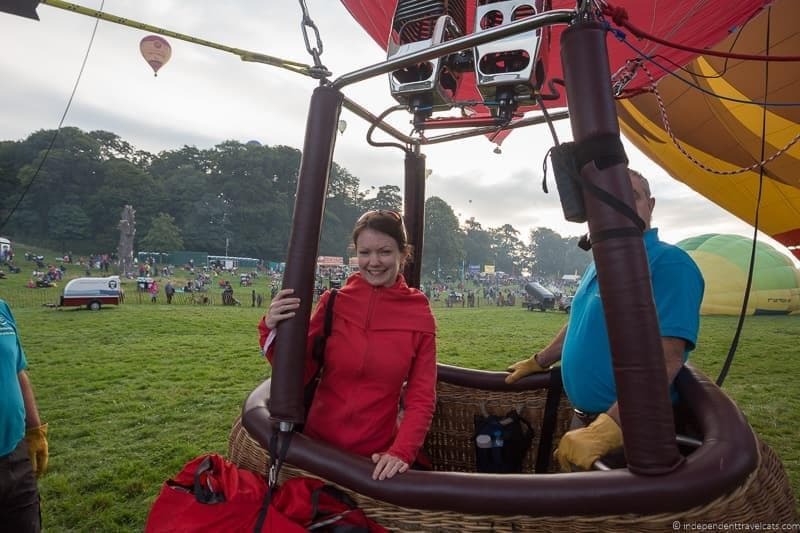 If you have booked a hot air balloon ride at the event that is cancelled, you will likely be given the opportunity to book an alternative time or date or be given a refund. Yes! A few companies offer paid passenger flights during the Balloon Fiesta. You can also book a flight before or after the Balloon Fiesta. You’ll need to book these well in advance as August is a very popular time to book a hot air balloon flight in Bristol! 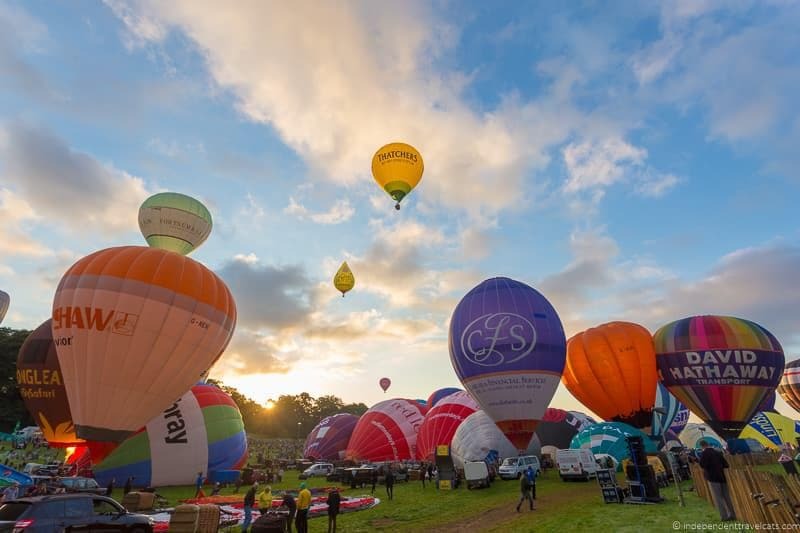 In terms of cost during the Bristol Balloon Fiesta, expect to pay £200.00 to £250.00 per person to go up in one of the mass launch events in a group (generally balloons hold 8 to 16 people depending on the size). If you go up outside of the festival, you can save 40% to 60% off the cost. Outside of the festival, expect to pay about £100.00 to £150.00 per person for a group flight. If you want an exclusive balloon (just you and your partner or family for instance) the cost goes up per person. There are several companies that operate in or near Bristol, and we’d recommend comparing prices and offerings from Bailey Balloons, Bristol Balloons, and th several options on Viator. All three offer year-round flights as well as flights during the Bristol Balloon Fiesta. Be sure to read all the terms and know the policy for what happens if your flight is cancelled. Yes, during and right after the balloon launch events you have a good chance of seeing them from many spots all over the city. 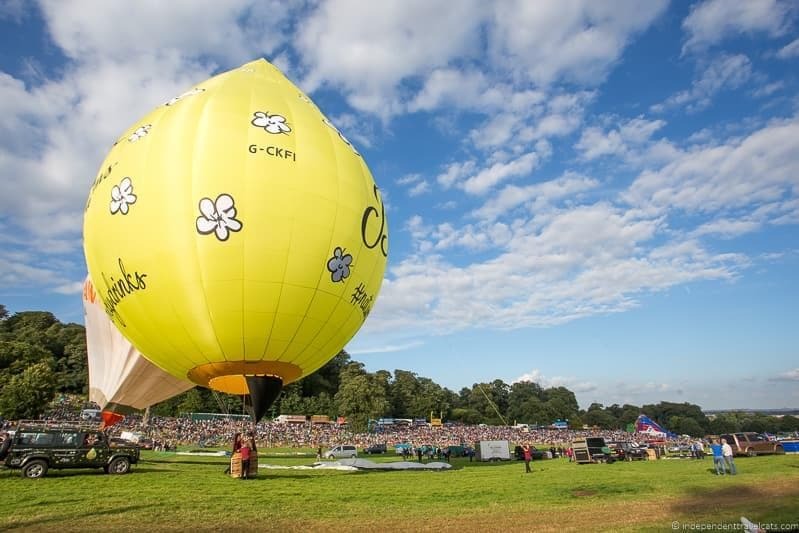 The majority balloons will launch from the festival area within Ashton Court Estate but then land outside of it. 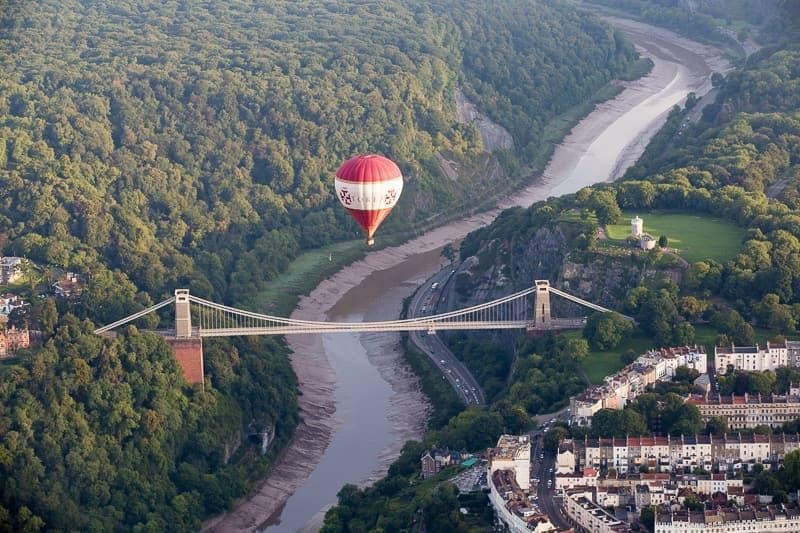 One of the iconic images of Bristol is the hot air balloons drifting around the Clifton Suspension Bridge and over the city. The problem is of course that you never know which direction the balloons are going to go and what parts of the city are going to be the best places to see them until the event is under way. But it seems they often head eastwardly over the city. I’d pack up some snacks, a blanket, your camera, and something to keep you occupied while you wait for the balloons to (hopefully) arrive overhead. and head to one of the city’s higher points. Just about any hill, high point, or rooftop will do. Where is the best places to see the hot air balloons in Bristol? 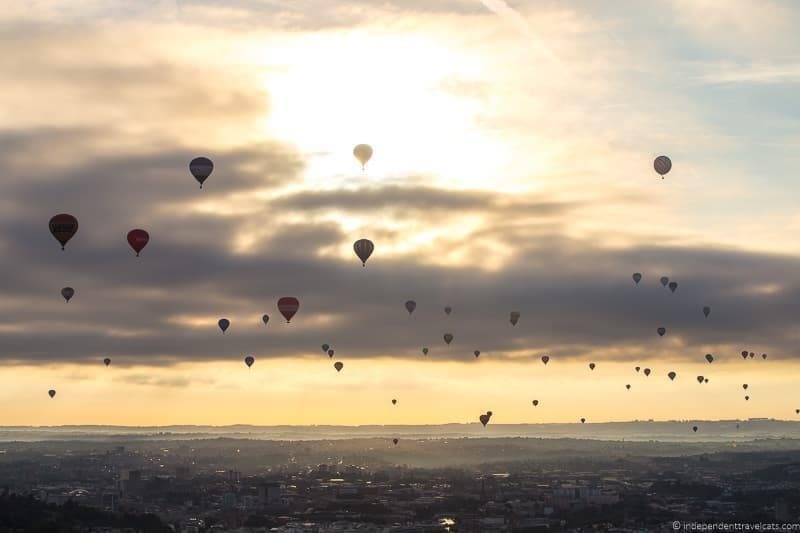 Leigh Woods, Dundry Hill, Clifton Observatory, Troopers’ Hill, Clifton Downs, Bedminster Park, Victoria Park, and Brandon Hill (near Cabot Tower) are all popular spots for those wanting to watch the balloons float past. Many local people simply grab a lawn chair and head outside their house or apartment when they start seeing them come by as you don’t need to be at a high point to see them overhead. Of course you can also grab a drink at a local pub or bar with outdoor seating and enjoy views from there. There are lots of options and establishments range from pub barges floating on the river to roof terraces. Some to consider are The Ashton (rustic pub with a beer garden near the balloon fiesta area), Urban Roof Terrace (hotel rooftop bar), The Apple (quayside cider pub barge), Bambalan (has a roof terrace), Grain Barge (terrace pub on a converted barge on the river), and The White Lion Bar (hotel bar with a terrace). If you decide to head to a bar or restaurant, go early to get a spot, as they will all likely be very busy throughout the festival. If you are trying to decide between going to the festival park or watching them from somewhere else in the city, I’d suggest doing both. If this is your first time to the event, I’d go to the park to watch a mass launch as well as a nightglow at the park. This is the only place you can see the nightglow events and the best place to see the balloons inflate and rise together in large groups. Once you’ve been to the park, then on a following day, you can avoid the hassle of the crowds in the park and find a spot elsewhere in the city to watch the next mass launch. However, if you really hate crowds, you may want to skip attending the festival all together and just view them from the city. 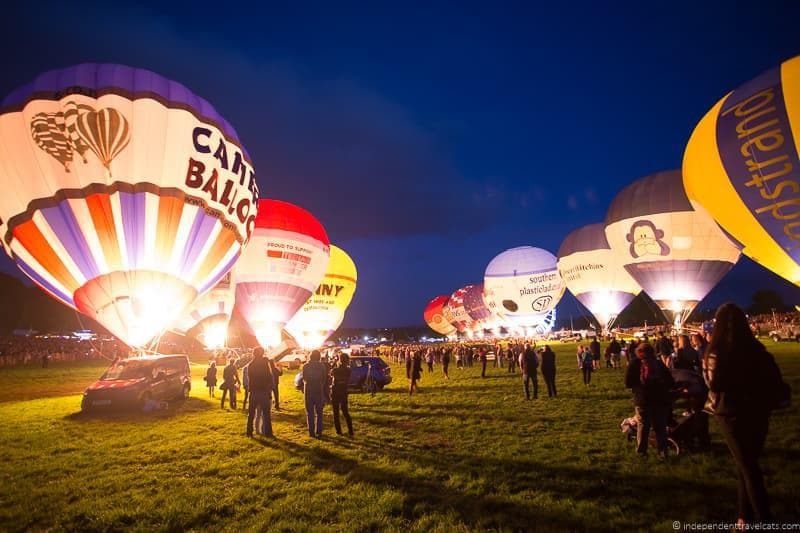 The best place to find out more information about the event is to check out the official website for the Bristol International Balloon Fiesta which provides the full event schedule, information on parking and getting there, and allows you to pre-purchase parking tickets. You can also contact the Balloon Fiesta team directly by calling them at +44 (0)333 321 0101 or emailing them with general questions at info@bristolballoonfiesta.co.uk. 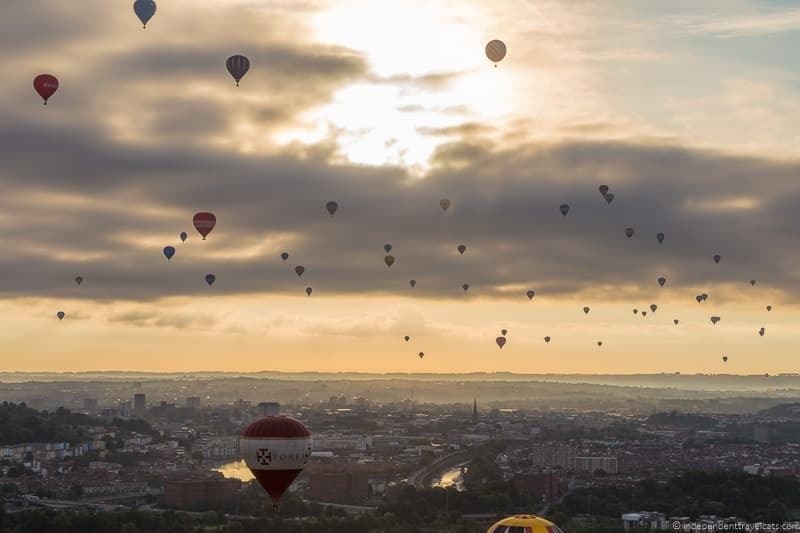 Once you know when you are coming for the Bristol Balloon Fiesta, you can think about what else you want to see and do in Bristol. To get you started, we recommend checking out our suggested 2 day Bristol itinerary, street art guide, and the official Visit Bristol city tourism website. 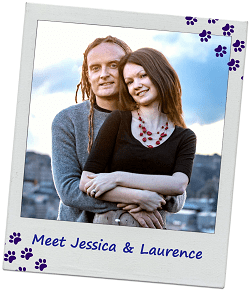 Laurence and I have actually been very fortunate to attend a number of hot air balloon events around the world. I have always found hot air balloons romantic and whimsical, but I really fell in love with balloons after I moved to Albuquerque New Mexico back in 2009. It was also there I attended the Albuquerque International Balloon Fiesta for the first time, returning again in 2016. Between Laurence and I we have attended several balloon events. I’ve flown in a hot air balloon now 6 times (Napa Valley, Albuquerque, Spanish Pyrenees, Cappadocia (X 2), & Bristol) and Laurence 7 times. We’ve also been part of a balloon crew on a couple of occasions so we know a bit now about hot air ballooning! So after learning that there was a large hot air balloon festival in England, I was excited to go after we moved to Scotland. 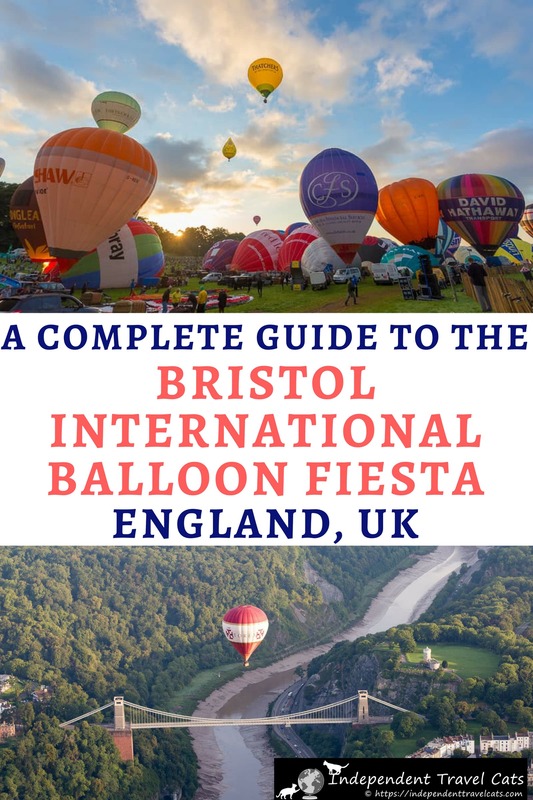 The Bristol International Balloon Fiesta began in 1979 and has grown to be the largest annual balloon festival in Europe (the largest is the Mondial Air Balloons event in France but it is biannual), and is also one of the top free events in Europe. We booked our accommodation in Bristol months in advance and stayed for 6 nights total We knew that the weather could be an issue so we were in the city during the entire 4-day Balloon Fiesta to have the best chances to see the balloons. Getting to the park for the first time was not that difficult although you will want to follow the signs once you get close, not your GPS as the Ashton Park Estate is huge. If you have pre-booked parking, like we did, you need to park in the lot designated on your ticket or pass. Then once there, the parking staff will direct you to where to park. It was then about a 10 to 15 minute walk into the park depending on when we arrived. Traffic was much worse in the late afternoons and evenings than in the mornings, so leave early when going to the event. Also be patient when leaving as you’ll likely be leaving at the same time as thousands of other people so the walk back, shuttle lines, and drives may take longer than you expect. The event itself was well set up and there were plenty of places to get food and drinks. There were also a lot more rides and children’s games than we had expected, and we liked that there were things to do in between the balloon events. Some of the entertainment was free (e.g., aerial acts, music bandstand shows) while other had an admission cost (rides, games, children’s interactive experiences). Event and safety staff were around so we were able to ask questions as needed for directions, etc. The balloons are set up and take off for all of the main events within a large fenced off area. To watch the balloons, visitors can see sit or stand around three sides of the field and then one side is taken up by enclosures for the balloon crews, media, announcers, and members. The viewing area at Ashton Court Estate slopes up so it makes it seem a bit like an amphitheater which is good for being able to see. While there was room for people to move around during the early morning events, it got much more crowded for the evening events. Now the only disappointment I had about the Bristol Balloon Fiesta is that as a visitor you can’t get super close to or walk around the balloons as you can at the Albuquerque Balloon Fiesta. Obviously this is for safety reasons for both the balloonists and visitors as I don’t think the launching field is large enough to support this with the crowds in Bristol. But from the park you do get to still get good views of the balloons as they are set up and launched. Once they take off, you get a really nice view as they take to the skies. The mass balloon launches are my favorite events at these kind of festivals because I just love seeing all the colorful hot air balloon fill the sky at one time. We went to one in both the morning and evening, although the evening one ended up being cancelled due to weather. The morning ones are tough due to the early start, but are rewarding if the balloons go up. We came and sat on the ground, nursing coffees to clear our foggy heads. The balloons during mass ascensions launch in waves, so different balloons will be in various states of being unpacked, inflated, and launched for about 1 to 2 hours. I enjoy watching the balloons as they are unpacked, rolled out, and inflated on the field. Then it is really exciting once several are standing up and they starting launching. There were over 135 balloons total that were registered at the event and I would guess that between 60 to 100 of them went up during each of the mass launches. I loved seeing the sky fill up with hot air balloons – I love seeing the different colors, shapes, and sizes. The special shapes are always some of our favorites. Laurence and I were lucky enough to be able to be able to ride in a hot air balloon during a morning mass ascension as press. We didn’t know if we would have a chance or not, but there was a free space the first morning and we were happy to be chosen to go! 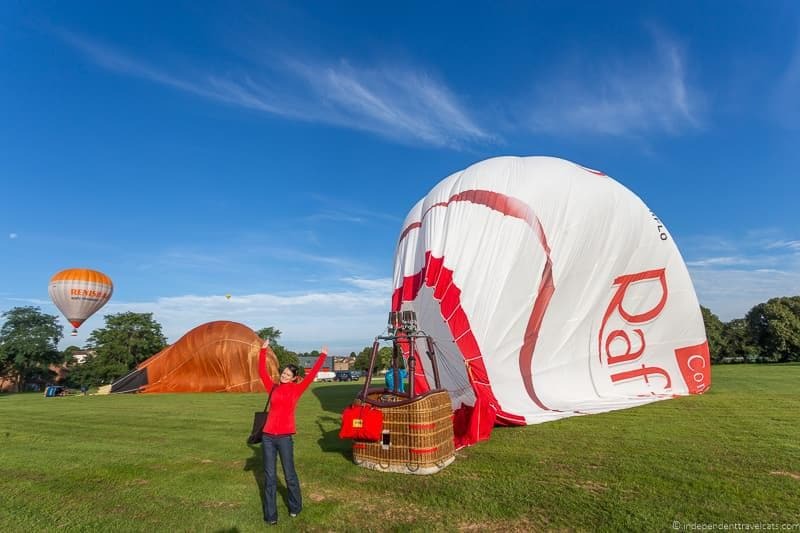 We rode with Ian Martin, a local Bristol pilot, who was flying a Raffaello branded balloon for Flying Enterprises. As we were waiting to take off, I was watching this one balloon which had an old and charred envelope (the balloon part) and I told Laurence that I didn’t think that one should fly. It turned out it was the Bristol Belle and it didn’t go up (although it is functional) but was inflated a few times during the fiesta because it was its 50th anniversary! That’s very old for a balloon. The Bristol Belle was the first modern hot air balloon built in Europe (the first ones were built in the United States by American Ed Yost, the father of modern hot air ballooning) so it was really awesome to see this treasure of ballooning history. We spent much of the time taking photos and shooting a live video (we did still have to work after all) but it is such a great experience to look down as you launch up over the other balloons. It was just the two of us and the pilot and it was a great experience taking off from the landing field with dozens of other balloons that morning. The views were amazing from above the field and then as we crossed the river and went over the city! Our ride only lasted about 30 minutes as Ian was keen to find a good landing spot. Normally though if you are paying for a ride (which we were not), the rides last at least 1 hour, sometimes 2 hours+, depending on the company. Once Ian landed us safely in a field, the balloon chase crew arrived and helped deflate and pack away the balloon. We helped with this which took about 1 hour and then we were driven with the pilot back to Ashton Court Estate where we returned to our car and had a bit of a rest! I think that for many people the evening balloon glows and fireworks are the favored event. They also tend to be the busiest nights of the festival, especially the Saturday night one. There is normally an evening mass launch around 6pm and then later there is the Balloon Nightglow and fireworks show. The balloons are set up and tethered. Then once it gets dark, the burners are lit to make the balloons light up after sunset. I would guess that there were about 20 balloons participating in the Nightglow we attended. During the Nightglow, there was announcements about each of the balloons. Then they did a series of synchronized burns so they light up in a sequence or all at once (“all burns”). There was also music playing and they synchronized their burns to the music which was pretty awesome to see and hear! Then after that, the fireworks show started. 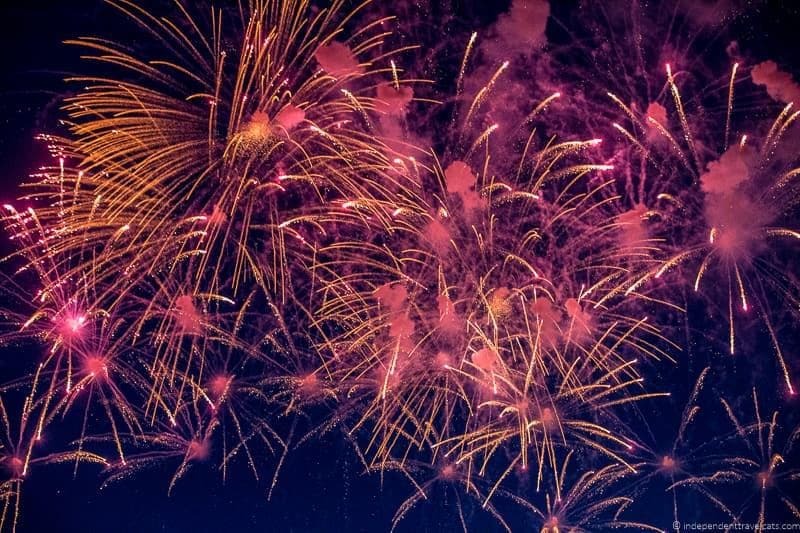 If you come in the late afternoon and stay for the mass launch, Nightglow, and fireworks, it is a really festive night out! Since we were in Bristol the entire 4 days, we got to see a mass ascent, a night glow, and fireworks from the Ashton Court festival site. Although one evening mass ascent was cancelled, all the other events had gone as planned. So after seeing everything in the first 2 days, we decided to try seeing the balloons from other parts of Bristol. We were staying in the Clifton area of Bristol, so Laurence walked out to a spot near the Clifton Observatory twice to get shots of the balloons over the river and bridge. On one occasion the event ended up being delayed and then cancelled due to weather (winds) so he didn’t get to see any balloons, but the other time he got some nice views and photos. Hot air ballooning requires a lot of waiting and patience! If you want to go, start planning and booking early! It is one of the busiest weeks of the year in the city and hotels sell out in advance and prices will go up the later you wait. Train tickets are also less expensive if you book in advance. If you plan to drive and park at the event, pre-book your parking passes! Try to be in Bristol for at least a few days so you have the best chance to see the balloons. Most of the events are very weather dependent and the events can be cancelled for more than a day in a row depending on wind, storms, etc. If you get to see them on your first day, you can either return to see them again or go out and explore the city. If you have never been to a hot air balloon event before, learning a bit about the history of ballooning and how hot air balloons work can get you more interested. This can be particularly educational for kids and get them more excited about the balloon fiesta. Sometimes there are events or demonstration organized by The British Balloon Museum & Library. Show up as early as you can for the events for the best experience. People often underestimate the amount of time it will take to get to and into the Park. Weekends are much busier than weekdays and evenings are busier than mornings so plan accordingly. There are several different types of hot air balloon events that may be of interest so plan accordingly. I’d recommend trying to attend at least one mass launch and one nightglow event. Bring a light jacket and dress in layers, and also be prepared for the possibility of rain. It is August so it is generally not cold but it is usually chilly early in the morning before sunrise and in the evenings after dark. You can bring folding lawn chairs, blankets, food, etc. although they may be inspected by security upon entry. Note that glass containers and bottles, air-horns, anything that could be construed as a weapon, fireworks, and drones are prohibited in the park. Do check the latest event guidelines about what you can and cannot bring as security rules do change. With the crowds it can be annoying to carry and keep watch over a lot of stuff so only bring things you know you’ll use. Anyone with mobility issues should check the accessibility information for the event in advance. Mobility scooters are available for rent at the park. Bring your camera, extra batteries or charger, and lots of memory cards or film. 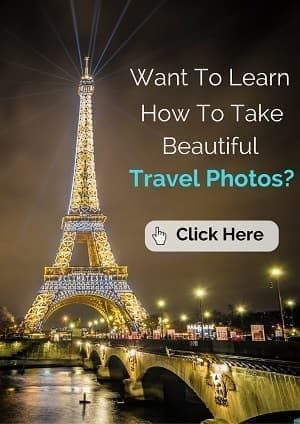 You’ll probably be taking lots of pictures! The best times for photos are generally around sunrise and sunset. In terms of crowds, I’d come to one of the morning mass ascents as fewer people attend and you’ll likely be able to get closer to the balloons. Although the hot air balloon events are the star attractions, don’t forget to take a look at what else is happening. There is entertainment happening throughout the 4 days which includes lots of music acts, performances, and children’s events. During our visit there were aerial performances with wingwalkers, circus performances, a race car, and several children’s experiences involving Nerf, Transformers, and My Little Pony. If you are heading out to try to see the hot air balloons elsewhere in Bristol, be sure to go early especially if you are driving. If you are going to a bar or restaurant, go early or make reservations in advance. August is a busy time in Bristol so in addition to making your travel plans well in advance, it is a good idea to think about what you want to do in the city before you arrive as all the main attractions and museums will be busier than usual. If you are looking to go to any of the city’s nicer or more popular restaurants, I’d be sure to book a reservation in advance. If it is your first time in Bristol, we suggest checking out our guide to things to do in Bristol to get you started! So that is our guide to the Bristol International Balloon Fiesta. If you ever have the chance to go to the Bristol International Balloon Fiesta, I would highly recommend going as it was a fun and colorful experience—and its FREE! 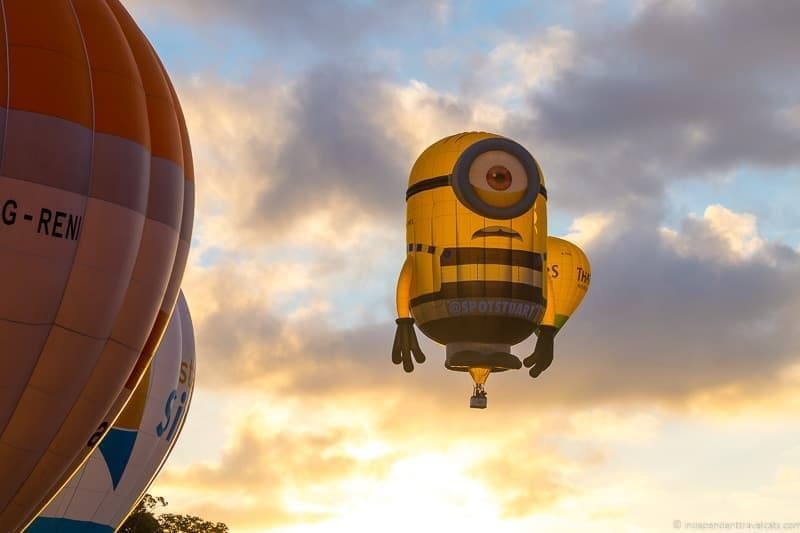 Have you been to the Bristol International Balloon Fiesta? If so, we’d love to hear about your own experiences and any tips you may have for future attendees. 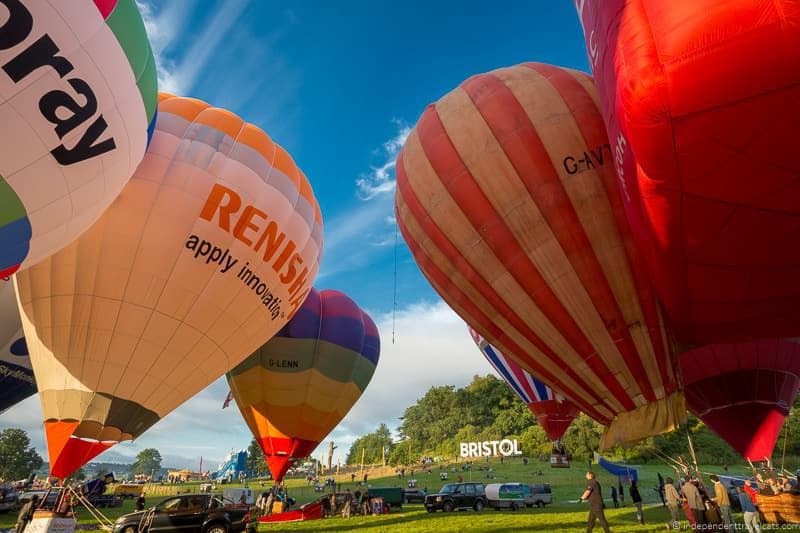 If you are planning a trip and have any questions about attending the Bristol Balloon Fiesta or anything related to visiting Bristol, just ask us in the Comments section below. We love hearing from you! Is Wes The Wolf hot air balloon going to be attending Bristol Balloon Fiesta 2019? 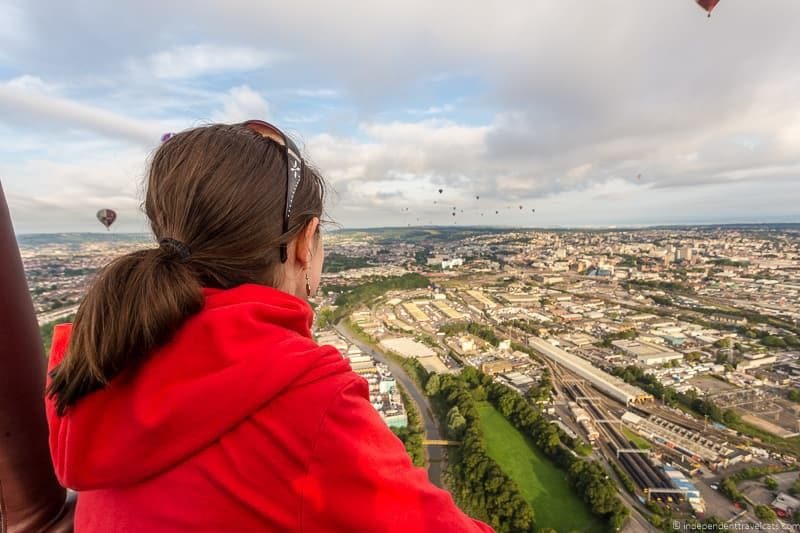 Great post – plan to go to the Bristol Balloon Fiesta next year! Very helpful stuff. 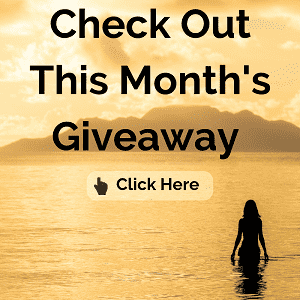 Very comprehensive post, like always. I had no idea they have a Balloon Fiesta in Europe as well. I’ve only heard about the Albuquerque International Balloon Fiesta, which I was hoping to see someday. It seems the one in Bristol is equally beautiful. I don’t think I’d dare to ride in a balloon, but I would surely love to photograph this great display. You took very nice pictures in Bristol. it must be so magical to see all these balloons in the sky! I put it on my bucketlist! I would love to attend one of these events. Actually, I went to one at the Coachella Valley but the mass ascension was canceled because the president of the US was in the area and they couldn’t have so many objects in the airspace. At least, I was able to see some of the balloons being filled with air. I know my experience is small when compared to actually flying a balloon and attending a huge event. Honestly! How have I not heard of this yet!! Definitely going to have to do this next year while I’m in England again for a friend’s wedding in August! This is perfect!! I’ve always wanted to go to a balloon festival and never knew where any were besides Albuquerque and Turkey. Thanks for sharing! Hi Lolo, I don’t know but I am glad you learned about the Bristol Balloon Fiesta here 😉 Yes, the dates are already set and tickets should be coming online for parking in the coming months, so you can already start your initial planning! Albuquerque (USA), Bristol (England), and Metz (France) host some of the top hot air balloon festivals. Turkey as far as I know does not have an actual balloon festival (they just have a lot of tourists flying on most days). There are also loads of smaller local balloon fiestas especially in the U.S. and Europe which are fun too and a lot less crowded. Excited that you may now get to go to the Bristol Balloon Fiesta – do reach out if you have any questions. We also spent 6 nights in Bristol so happy to give any further recs. An event like this is just the perfect family outing, especially if the weather cooperates. I love that this runs over a couple of days so you can hopefully get a shot at at least one nice day! We have something similar in New Mexico each October, and I’d love to go. It’s just a feast for the eyes. I’ve been in a hot air balloon once and it was a very peaceful experience… it was a surprise from my parents for my 16th birthday! Beautiful pictures of the balloons! I’ve been to a balloon glow event once, and it was when I didn’t know much about photography or my camera. I always find the pictures so lovely and seemingly peaceful. (Yours evoke those same feelings…. especially the ones with the bridge. Just gorgeous.) Definitely pinning for later inspiration! We love balloon festivals, but wow – that scenery is gorgeous! What a great backdrop for the balloons. Looks like you had a great time! We’ll have to be sure we’re “in country” at the right time to see that ourselves. Thanks for sharing! I had no idea about this festival but it looks fabulous. I would love to go sometime and also do a balloon ride. Thanks for all the tips and the lovely pictures. I’d love to see the night glow launches as well… it’d be such a disappointment if you were only able to spare one day in Bristol and it rained. Unfortunately I don’t think many people were dressed in Victorian or Steampunk but I am sure you could show up dressed however you wanted 😉 The early ballooning events date back to the late 18th century actually, although most of the modern big balloon festivals (Albuquerque, Bristol, Lorraine) date back to the 1970’s. Yes, the weather is always tricky, but it would be unusual, especially in August, for all the days to have bad weather. In my experience the events happen more than they don’t but there are almost always cancellations at balloon festivals. Best to try to visit for the entire festival and then you are fairly guaranteed to see them. Every year we say we must go to the balloon festival as we only live about 50 miles up the road and we still haven’t been. This is a very useful guide for the festival which I have pinned for future reference!